This Avenger travel trailer allows you comfort and relaxation anywhere you go. Inside, you will enjoy the entertainment center and TV while sitting on the theater seats, the sofa, or while eating at the free standing dinette. The chef in the family is sure to love cooking in the rear kitchen which features a U-shaped counter area, plus a pantry for dry goods! 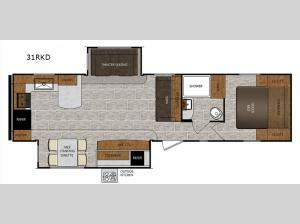 Mom and dad will appreciate the private front bedroom in this unit that includes a queen bed and his and her's closets. After a day of hiking or biking, clean off in the full bath that features a skylight above the shower for your taller family members. Come check out this travel trailer today and get started on your next adventure!